Microsoft announces new features to Flow’s approval processes management. Flow now allows you to easily create an approval workflow for your data in SharePoint, Dynamics CRM, Twitter, Visual Studio Team Services, MailChimp and many others. The approvers will receive email notifications about pending approvals, and they can view and respond to all approval requests in the new unified approvals center. Create an approval process in seconds. Rich templates and a streamlined design experience make it possible for any user to quickly configure an approval process. Keep business running smoothly with approvals everywhere needed. Flow now offers a smooth mobile experience for approving or rejecting requests on the go. Requesters and approvers will have a consolidated web view of everything they need to act on and can see their full approval history. Let’s imagine that you manage your team’s Twitter account and want to set up an approval process to automate proposed Tweets from your teammates. You can ask your teammates to enter their proposals in a SharePoint list and create a flow such that whenever a new item is added, you start an approval process with item details. If you approve then post the tweet and notify the creator. If you reject, then email your teammate with your feedback. The Start an approval action allows you to enter a title and specify the approver. You can also optionally enter details, such as the proposed tweet text, and a link to the list. These fields will be surfaced to the approver in the Approvals Center. You can also capture the approver’s feedback with the Comments output. 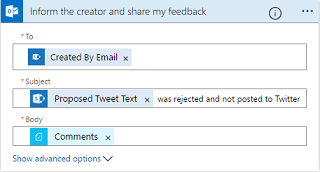 In our Twitter approval example, you can email your teammate informing him/her of why the tweet is unsuitable. When an approval request is assigned to you, you will receive an email notification matching the title, details, and item link described in the Flow. Clicking on the Approve or Reject buttons will lead you to the Approvals Center. Here you can see all your pending approval items. Similarly, if you have the Flow Mobile app (available on iOS and Android), clicking on Approve or Reject will take you to an approval screen in the app.